Celebrating our 29th Season in 2019! In case of rain, call (812) 283-0301 and the message will tell you if the concert has been canceled. We will also post an announcement on our Facebook page. 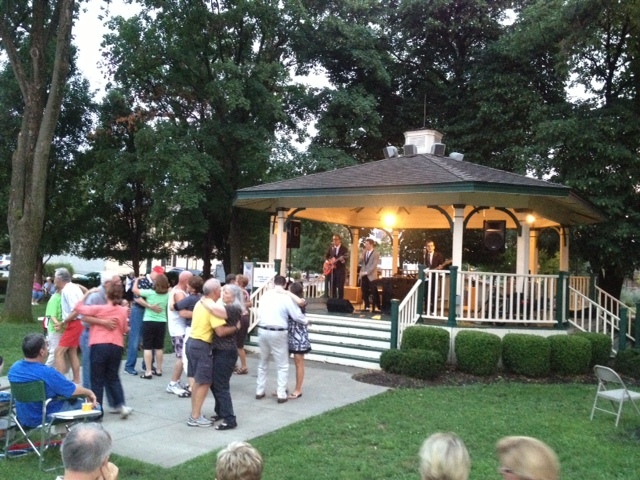 The Free Concerts in the Park are a wonderful tradition, sponsored by our nonprofit organization, Jeffersonville Main Street Inc. and the Jeffersonville Parks Department. On Friday evenings Mid-May to Mid-September you can find the Warder Park gazebo replete with a brass band and surrounded by a crowd of all ages. Some bands pay tribute to the people who served in the armed forces and it makes for a lump-in-your-throat moment – genuinely patriotic and heartfelt. Veterans stand and are applauded as their branch’s theme song is played. It’s an image Norman Rockwell would have admired. The look and spirit of this historic downtown Jeffersonville Park are part of the draw to this special place. It’s a slice of Americana. At the Concerts in the Park, people sit back in their lawn chair and hear first-rate local music. Many times the dance floor is crowded with couples who are cheek-to-cheek in the dappled light coming through the leaves. At intermission, they visit with friends and buy refreshments from the Boy Scouts or a church group. People stroll down the sidewalks of Spring Street and Court Avenue, peeking in shop windows and taking note of the way the area has revitalized in the last 20 years. While a good number of the audience have gray locks on their heads, we also see lots of younger families in attendance that are looking for more wholesome quality time with their children and neighbors. The concerts were originally designed to bring people back downtown. That we have achieved: at several concerts we usually surpass 700 attendees. Estimated seasonal attendance for the concerts is more than 10,000. The people in the audience make the concert series a success and it is a pleasure seeing so many familiar faces every Friday night.